BENEATH THE SURFACE PUBLISHED BY EDITOR MANAGING EDITOR Four Point Publishing Jennifer Kramer Eliina Lizarraga High Resolution Safety hortly after the September '08 issue was published, we received the following e-mail: Your selected cover photo for the referenced "Stadium Floor Coatings Touchdown" article lacks most of the article's noted Safety Considerations. None of the workers on the cover are wearing basic PPE! Hard hats, steel-toed boots, ear protection, respirators, safety glasses, and even gloves are all missing as this crew is applying resinous flooring. 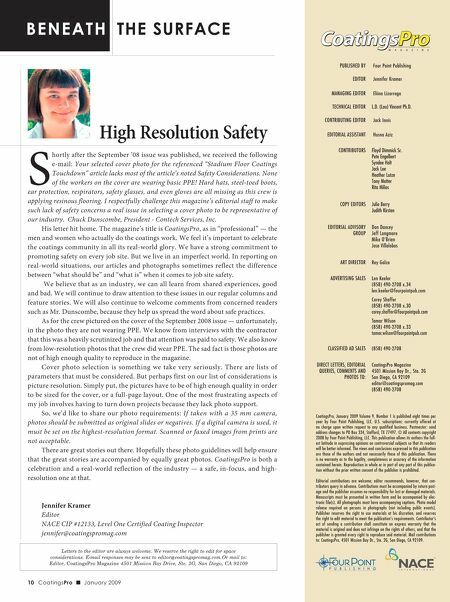 I respectfully challenge this magazine's editorial staff to make such lack of safety concerns a real issue in selecting a cover photo to be representative of our industry. Chuck Dunscombe, President - Contech Services, Inc. His letter hit home. 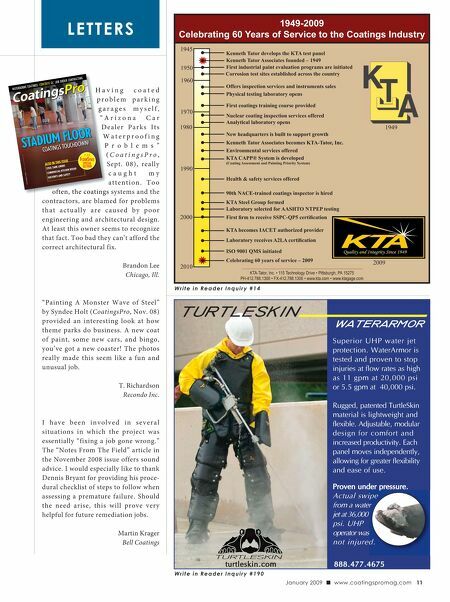 The magazine's title is CoatingsPro, as in "professional" — the men and women who actually do the coatings work. We feel it's important to celebrate the coatings community in all its real-world glory. We have a strong commitment to promoting safety on every job site. But we live in an imperfect world. In reporting on real-world situations, our articles and photographs sometimes reflect the difference between "what should be" and "what is" when it comes to job site safety. We believe that as an industry, we can all learn from shared experiences, good and bad. We will continue to draw attention to these issues in our regular columns and feature stories. We will also continue to welcome comments from concerned readers such as Mr. Dunscombe, because they help us spread the word about safe practices. As for the crew pictured on the cover of the September 2008 issue — unfortunately, in the photo they are not wearing PPE. We know from interviews with the contractor that this was a heavily scrutinized job and that attention was paid to safety. We also know from low-resolution photos that the crew did wear PPE. The sad fact is those photos are not of high enough quality to reproduce in the magazine. S Cover photo selection is something we take very seriously. There are lists of parameters that must be considered. But perhaps first on our list of considerations is picture resolution. Simply put, the pictures have to be of high enough quality in order to be sized for the cover, or a full-page layout. One of the most frustrating aspects of my job involves having to turn down projects because they lack photo support. So, we'd like to share our photo requirements: If taken with a 35 mm camera, photos should be submitted as original slides or negatives. If a digital camera is used, it must be set on the highest-resolution format. Scanned or faxed images from prints are not acceptable. There are great stories out there. Hopefully these photo guidelines will help ensure that the great stories are accompanied by equally great photos. CoatingsPro is both a celebration and a real-world reflection of the industry — a safe, in-focus, and high- resolution one at that. Jennifer Kramer Editor NACE CIP #12133, Level One Certified Coating Inspector jennifer@coatingspromag.com Letters to the editor are always welcome. We reserve the right to edit for space considerations. E-mail responses may be sent to editor@coatingspromag.com.Or mail to: Editor, CoatingsPro Magazine 4501 Mission Bay Drive, Ste. 2G, San Diego, CA 92109 10 CoatingsPro J January 2009 TECHNICAL EDITOR L.D. (Lou) Vincent Ph.D. CONTRIBUTING EDITOR EDITORIAL ASSISTANT Jack Innis Husna Aziz CONTRIBUTORS Floyd Dimmick Sr. Pete Engelbert Syndee Holt Jack Lee Heather Lutze Tony Matter Rita Milios COPY EDITORS Julie Berry Judith Kirsten EDITORIAL ADVISORY GROUP Don Dancey Jeff Longmore Mike O'Brien Jose Villalobos ART DIRECTOR Rey Galza ADVERTISING SALES Len Keeler (858) 490-2708 x.34 len.keeler@fourpointpub.com Corey Shaffer (858) 490-2708 x.30 corey.shaffer@fourpointpub.com Tamar Wilson (858) 490-2708 x.33 tamar.wilson@fourpointpub.com CLASSIFIED AD SALES (858) 490-2708 DIRECT LETTERS, EDITORIAL QUERIES, COMMENTS AND PHOTOS TO: CoatingsPro Magazine 4501 Mission Bay Dr., Ste. 2G San Diego, CA 92109 editor@coatingspromag.com (858) 490-2708 CoatingsPro, January 2009 Volume 9, Number 1 is published eight times per year by Four Point Publishing, LLC. U.S. subscriptions: currently offered at no charge upon written request to any qualified business. Postmaster: send address changes to PO Box 334, Stafford, TX 77497. © All contents copyright 2008 by Four Point Publishing, LLC. This publication allows its authors the full- est latitude in expressing opinions on controversial subjects so that its readers will be better informed. The views and conclusions expressed in this publication are those of the authors and not necessarily those of this publication. There is no warranty as to the legality, completeness or accuracy of the information contained herein. Reproduction in whole or in part of any part of this publica- tion without the prior written consent of the publisher is prohibited. Editorial contributions are welcome; editor recommends, however, that con- tributors query in advance. Contributions must be accompanied by return post- age and the publisher assumes no responsibility for lost or damaged materials. Manuscripts must be presented in written form and be accompanied by elec- tronic file(s). All photographs must have accompanying captions. Photo model release required on persons in photographs (not including public events). Publisher reserves the right to use materials at his discretion, and reserves the right to edit material to meet the publication's requirements. Contributor's act of sending a contribution shall constitute an express warranty that the material is original and does not infringe on the rights of others, and that the publisher is granted every right to reproduce said material. Mail contributions to: CoatingsPro, 4501 Mission Bay Dr., Ste. 2G, San Diego, CA 92109.